Washington, DC, is home to a number of affordable golf courses, offering scenic views as well as challenging holes for all levels. Select from the list below for your next game. With three courses offering challenging play, East Potomac Golf Course is a solid choice. This is one of the better public courses in the area, giving players the unique opportunity to aim one of your tee shots at the Washington Monument. The East Potomac Golf Course is located along the Potomac just south of the Jefferson Memorial near Hains Point. A longer course with some of the best par five holes in the city, this course is known for its leisurely pace and social amenities. The Enterprise Course is located just outside the Beltway in Mitchellville, MD. A wide-open course, perfect for beginners, Falls Road Golf Course provides challenges for all types of golfers. It's a links-style course that allows players to experience how golf is played in Scotland. The Falls Road Course is located in Potomac, Maryland, off Falls Road. Tucked away in close proximity to some of the top country clubs and private courses, Goose Creek Country Club is in very good company. 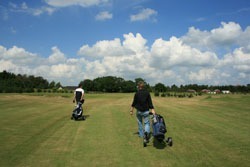 Considered one of the best golf deals in town, the course is very forgiving toward beginners. The course record is still held by Ben Hogan at 59. 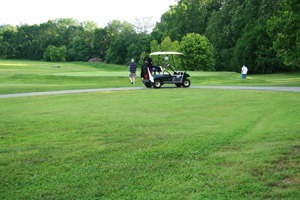 The Goose Creek Country Club is located in Leesburg, VA off Route 7. Greendale is a driver-friendly course with wide-open Bermuda fairways. To keep it interesting, the course features several water hazards. The signature 17th-hole offers spectacular views of the entire course and surrounding neighborhoods. Greendale is located just south of the Beltway in Alexandria, VA off Telegraph Road. A course facing Sugarloaf Mountain, Little Bennett provides many beautiful views. The fairways are tight and some of the drives must be hit uphill, but the course overall is a great choice for the price. It's a little long for the average golfer, but worth it’s well worth it to play a round. Little Bennett is located in Clarksburg, MD east of I-270.